It comes from ONS's Economic Review for July 2013. There are a couple of key things that this shows. The first is systematic underestimation of the damage to the UK's economy. The 2008/9 recession was deeper than previously estimated and output remains lower. But the second is to my mind more interesting. The 2008/9 recession was originally thought to be similar to the 1979 recession. We now know it was quite a bit deeper and lasted longer. But the shape of the curve was actually more like the 1990 recession, which unlike the 1979 recession involved a property market crash. Indeed the two lines parallel each other nicely - even with the revision - until the 10th quarter after the crisis. Then it all went wrong: even though the second dip shown on the original line has now turned into simply a flattening of the curve, the economy stopped recovering then and there has been little growth since. It is all too easy to blame this on the Coalition government that took office in May 2010 with a deficit-cutting agenda. But at the time, the economy was growing and the big issues were government finances and inflation. No-one thought that GDP was at risk: the trajectory was for a recovery similar to that in the 1990 recession, and there was no particular reason to think that it would fail. 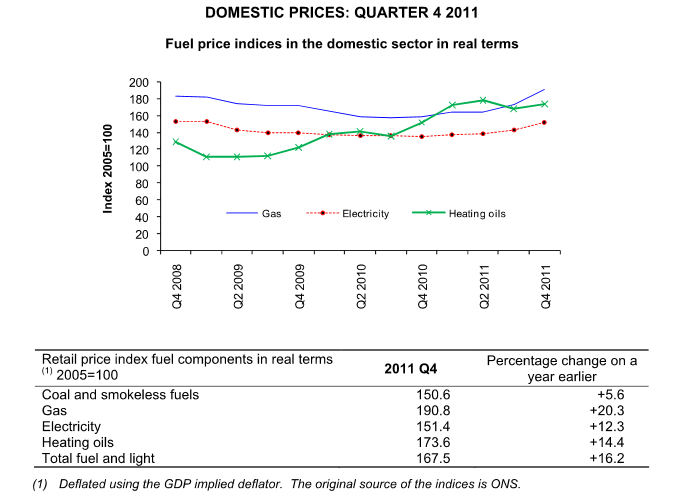 Even when the economy tipped into recession in Q4 2010, the ONS review for February 2011 blamed it on bad weather. The abrupt change of growth trajectory suggests that a pretty major exogenous shock hit the economy towards the end of 2010. But finding out what that shock was, and why it derailed the recovery so comprehensively, requires some detective work. Despite numerous claims that the recovery was "killed by austerity", there is actually nothing very obvious on the Government's part to explain such a change at that time. The economy was already slowing in the third quarter of 2010, which is before any of the Government's spending cuts took effect. There was the increase in VAT to 17.5% - but really that should not have been sufficient to knock the economy off course, since all it was doing was reversing a previous reduction. And the second VAT rise didn't happen until January 2011. There is one very obvious external shock - the Irish sovereign bailout in November 2010, to which the UK government contributed. Ireland is one of the UK's most important trading partners and the two financial systems are deeply interconnected. A major shock to the Irish economy would inevitably rebound to the UK. But....was that bailout really such a shock? It was widely expected, and the Irish banking system whose failure made the bailout necessary had already been moribund for two years. The conditions of the bailout would involve harsh austerity measures in Ireland, which would affect the UK's exports and the activities of UK companies in Ireland - but those would take time to kick in. And anyway, is the rebound from a shock to an economy the size of Ireland really capable of knocking the UK out of orbit? I am unconvinced. Ireland obviously had some impact, but I think we need to look elsewhere for the main cause. In fact another look at these curves suggests an alternative explanation for the UK's trajectory change and stagnation. From Q4 2010 onwards, the curve looks less like the 1990 and 1979 curves, and much more like the 1973 one. It's bumpy - which suggests a series of shocks rather than one single shock. Now we know that the 1973 crisis was triggered by an oil price shock and was characterised by energy shortages, although it also had a bit of a banking crisis attached. And it involved high inflation - admittedly much of this was domestically generated due to loose monetary and fiscal policy fuelling a wage-price spiral, plus the devaluation of sterling, but the oil price shock itself also increased inflation due to the UK's external energy dependence. Do we possibly have a similar situation from the second half of 2010 onwards? 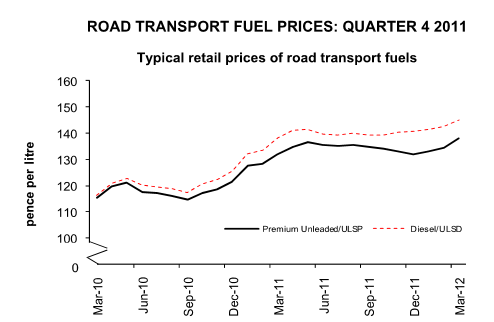 So from September 2010 to June 2011 road fuel prices - both petrol (gasoline) and diesel - rose by about 17%. That would particularly have hurt three groups: the haulage business; businesses that depend on frequent stock deliveries; and households where the principal earner(s) are essential car users. So the picture is one of a promising recovery being kneecapped by an energy crisis. The VAT rise in January 2011 only added to the problem. Now, enthusiasts of monetary policy will tell you that exogenous supply-side shocks don't have as big an impact on economic performance as they did in the 1970s because central banks can offset the damage. I think the entire world now knows that I am sceptical about the claimed benefits of unconventional monetary policy, but I'm prepared to be convinced that central bank intervention would have helped here. If the Bank of England was doing it, of course. But it wasn't. The first round of QE was from March to November 2009. And the Bank of England did no more monetary easing until October 2011. Furthermore, in 2010 it withdrew the Special Liquidity Scheme that had kept the UK's damaged banks afloat. Simon Nixon of the Wall Street Journal claims that this amounted to a tightening of monetary policy which directly caused the slowdown of the UK economy in the last quarter of 2010. I'm not sure I would go quite that far, though it undoubtedly contributed to tight credit conditions for households and SMEs. But certainly the Bank of England did absolutely nothing to ease the tight monetary conditions caused by the exorbitant energy price rises for business. And the Coalition government, elected as it was on a deficit-cutting platform, chose to ignore the evidence that energy price rises were strangling businesses and crippling households. It imposed a sharp fiscal consolidation at the same time. Personally I'm inclined to exonerate the Bank of England here. The usual response to high consumer price inflation would be to raise interest rates. But that would have been completely the wrong medicine for an economy in which private sector debt was very high and the financial sector badly damaged, and it would have been terrible for companies facing high and rising energy costs. For an inflation-targeting central bank, doing nothing amounted to monetary easing, since it involved turning a blind eye to the fact that CPI was well above target. The ECB did raise interest rates at this time, and some people have suggested that it was this action that triggered the Eurozone crisis itself - the catastrophic rises in bond yields that drove some sovereigns to near-default. Personally I think the ECB's rate rise was like the UK Government's VAT rise - it didn't cause the problem, but it added fuel to the flames. But I'm not nearly so happy about the UK Government's behaviour. In my book, dealing with the consequences of a negative supply-side shock is the responsibility of the fiscal authorities, not the central bank. Osborne's programme of front-loaded fiscal austerity was similar in spirit to Geoffrey Howe's approach to dealing with the UK's economic problems in 1979. And to some extent the situation looked similar. There was an oil shock in 1979 which contributed to the recession, but the main issues at that time were fiscal discipline and supply-side reform. I suspect that the Government thought the situation was indeed similar and that therefore fiscal reform was more important for the economy than compensating for the negative energy supply shock by, for example, cutting fuel duty and suspending green levies on household and business energy bills. And to be fair, fiscal reform was also the principal concern of many economists, investors, market advisors and international institutions, not to mention the British public that had elected the Coalition government (admittedly with a very small mandate). So despite the evidence that the economy was weakening, the Government went ahead with its spending cuts and tax rises. But the situation was actually very different from 1979. There was no sign of the wage-price spiral that had driven inflation throughout the 1970s: real wages were falling and people were even taking nominal wage cuts in order to stay in their jobs. The private sector - companies and households - was highly indebted and desperate to deleverage. And the financial sector was badly damaged. In short, the economy was extremely fragile. So the combination of a negative energy supply shock with the tightening of lending conditions, the Irish bailout and the Government's austerity drive was enough to knock it from growth to stagnation. Perhaps some more monetary easing would have helped, but the prospect of even higher inflation was just too much. Energy prices flattened out in the second half of 2011 then rose again from 2012 onwards, not continuously but in fits and starts. Businesses and households continue to face high and rising energy costs, a growing number of households are in fuel poverty - having to choose between heating their houses and buying food, and business expansion is hampered by the high cost of energy. Environmentally this is maybe a good thing, but economically it is disastrous. When businesses cut energy consumption due to rising costs they also cut production. When households cut energy consumption due to rising costs they do fewer activities and travel smaller distances. So expensive energy is a serious drag on economic growth. Even now, few people talk about the impact on the economy of rising energy costs. And yet the future is likely to see energy becoming ever more expensive until we finally accept that the hydrocarbon fuel industry is in terminal decline and the future lies with other, newer energy technologies. And while energy consumption remains constrained by high prices and scarcity, growth will remain a distant dream. Brilliant analysis! Interesting that the US is now ramping up its economic growth on the back of cheap oil and gas using fracturing technology. 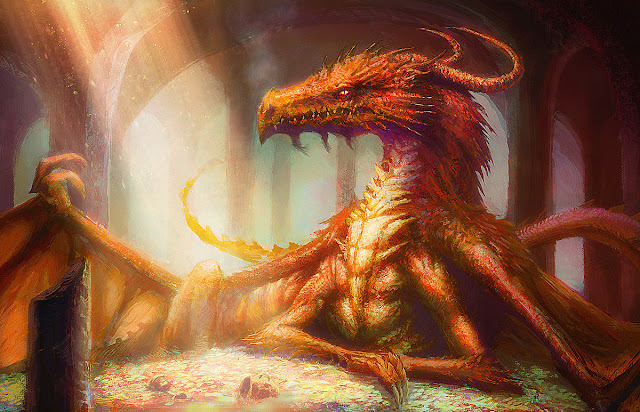 Will we be next? Will the green energy lobby find itself marginalised because, quite clearly CO2 is a benefit, not a threat? Will all those useless windfarms become redundant? The point was that because the BoE supposedly targets inflation, it was essentially forced to withdraw stimulus when hit by a supply side shock. If you target the price level and a supply side shock shifts the SRAS curve up, it must necessarily lower demand. Don't forget that the UK was hit by a number of supply side shocks, in effect, because of regulatory changes. Shifting the Higher education budget onto consumers through higher fees was a pretty obvious one, but also various components of the CPI are regulated, e.g. energy, water, etc, and these were allowed to rise in line with their agreed contracts at a time when demand was falling and a free/competitive market would have been forced to cut prices, or at least under pressure to do so. So the BoE was responsible, but only indirectly via its inflation mandate. King did his best by ignoring some of the regulatory changes - the "looking through" language, but the UK needed to let the CPI rise above 5% just to stay in the same place in the SRAS curve, never mind "support the recovery". So yes, a supply side shock derailed the recovery, but only because the BoE targets inflation. So you can blame the treasury for writing the mandate and failing to foresee the combination of a supply side shock in a primarily demand side recession. At the time that I am writing about in this post, global energy prices were rising sharply, and these fed through into double-digit inflation in domestic and industrial energy prices in the UK. I haven't discussed the causes of the global energy price rises in this post, but high demand from China plus the Fed's QE2 and weakness of the dollar were a large part of it. I noted in the post that HMT made matters worse by failing to use appropriate fiscal policy to offset the effect of such high inflation in energy prices, and by imposing fiscal consolidation at the same time. The weakness of sterling also increased the inflationary effect of global energy price rises. But the supply-side shocks I am talking about in this post are not directly due to either HMT or BoE policy. I agree with Mr Cox above that this is a brilliant analysis. Must admit that I have been saying much the same thing for the last couple of years (to normally deaf ears). Also odd that the OBR and IMF/OECD also point to rising energy/fuel prices as the main reason for the UK missing its growth forecasts, and yet even they get little attention. Which is odd because any "water cooler/down the pub/reading the papers" analysis of what most people have to moan about economically is high electricity and gas prices. And also high food prices (partly caused by the rise in transportation and fertiliser costs which are oil-related). You are right to remind us that back in June 2010 there didn't seem to be much concern that a recovery was under way and that fiscal consolidation could be started safely (I'd query your "small mandate" comment as all three parties electioneered on "cuts worse that Thatcher's"). And I'd agree that Osborne's potentially biggest mistake was not adapting his June 2010 strategy when it was clear that higher oil and energy prices were having a material impact on inflation and thus household incomes. The only other issue I'd throw into the mix is one of confidence or animal spirits. Prof Blanchflower almost daily tweets that Osborne "talked down the recovery" with his language of austerity and "verge of bankruptcy". However the confidence indices don't show any great drop in consumer confidence until 2011. However what I have always felt was the bigger confidence drainer was the fact that the BBC news daily led with Robert Peston from Athens suggesting that wholesale European economic collapse was just days away. Coming back from an expensive shop at Sainsburys, having spent near £100 filling up your car, opening you gas bill whilst turning on the evening news was never going to result in a strong consumer recovery in 2010/11. "Personally I'm inclined to exonerate the Bank of England here. The usual response to high consumer price inflation would be to raise interest rates." I disagree. There is no theoretical reason to react to headline CPI. There is a whole literature on the optimal inflation target, for instance see Aoki (2001) and Mankiw and Reis (2003). The conclusion of this literature was that central banks should target core inflation and ignore price changes due to volatile commodities prices such as energy. King undoubtedly knows this literature, but others on the MPC over the period clearly did not (shockingly including Besley who called for rate rises in mid 2008 and less shockingly Sentance who called for tighter monetary policy for pretty much his entire tenure on the MPC). This was unforgivable lapse in monetary policy. The economy was hit by non-persistent supply shocks, (energy and taxes) which textbook monetary policy suggests should be ignored, yet the MPC did nothing or called for tighter policy. As in the Great Depression, the ongoing great recession is due to a failure of central bankers. Oh and is it just me or was King's call for austerity in 2010 effectively arguing: we need to tighten fiscal policy now, so we can keep monetary policy at the zero lower bound for longer? Firstly, in my view, the inflation in fuel prices was a purely financial phenomenon caused by the influx into oil markets of 'inflation hedging' passive investors who were mis-sold oil market price by investment banks. Through this attempt to avoid inflation, these 'muppets' actually caused it, and we have seen as a result a transfer of purchasing power from oil consumer economies to oil producer economies. That bubble and transfer is now coming to an end - possibly with a bump, as in 2008 - as this money flows out to inflate nominally income producing property and stock price. 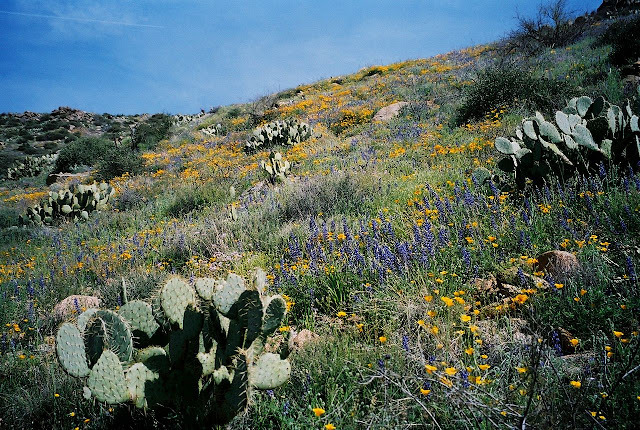 It's interesting that what is bad for the economy is good for the environment. How then can we square this circle? The answer is to follow the Danish approach, which has since 1973 been to mandate an over-riding 'least energy cost' policy principle of minimising carbon fuel use for a given output of electricity, heat and power. The result? Since 1980 Denmark's GDP has risen by 78%; energy use has been flat; and (imported)carbon fuel use has significantly declined. Also, a country of 6m souls grew the largest wind turbine manufacturer in the world, Vestas, and amassed an unmatched body of expertise in heat engineering as they built out a network of community heat infrastructure and co-generation. They were able to fund this because they had widespread wealth and - for most of the time (the neo-liberal rot has since set in) - decentralised devolved fiscal capability funded by local land taxes. So how can anyone else fund it? 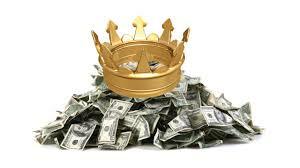 Monetise energy - within suitable framework agreements -through prepay instruments, and invest directly, through loans denominated in energy, in nega watts and nega barrels of energy savings. One of the Big Trades of the 21st century will be the exchange of the value of knowhow and knowledge/IP for the value of carbon fuel saved. As I said recently at conferences in Baku and Tehran: don't just prospect and drill for oil and gas; prospect and drill for oil and gas savings. The Iranians don't really have a choice at the moment. I don't agree that the 2010-11 energy price spike was entirely a financial phenomenon. Financialisation was a significant factor - and I think the Fed's QE pushed up oil prices, too. But at that time demand from EMs, especially China, was soaring (it has since reduced), and North Sea production was squeezed. Oh, and the Deepwater Horizon spill ran from April - September 2010. So in my view there were both endogenous and exogenous factors putting pressure on world energy prices. I remember at that time (2010) the notion that the West was using QE to lower real oil prices and that oil producers got together to prempt this 'devious' plot by increasing oil prices. Since then the situation has changed with fracking & over supply of oil becoming more topical. My take is that the major financialisation was the re-inflation of the bubble after the price collapsed to $35/bbl in late 2008; the Saudis panicked, and after Obama's election (he's a Big Finance president not a Big Oil president like Bush) JP Morgan sold the Saudis prepay contracts funded by the wave of panicked inflation hedger investors at that time. You may remember the super-contango in the first half of 2009 as this money inflated the price. Also the fleets of tankers off the UK storing oil funded by the contango and which the Daily Mail laughably said was caused by greedy speculators 'hoarding' oil. The Saudis have since acted de facto as an oil central bank, keeping the oil and/or product price pegged between levels which on the one hand (oil price collar) avoided revolution in Saudi, and on the other (product price cap) did not threaten re-election for Obama in the US. In 2010/11 we saw the Iran risk premium, through the influx of speculative money. Now we see Rowhani's election, and an incoming government which will definitely aim for accommodation with the US. Obama's problem is the head-bangers in Congress, and I don't think he can relax financial sanctions even if he wants to. But I digress onto my favourite subject, Iran. I don't buy the entire story of Chinese demand for consumption, I think (impossible to know) a lot of it has been reserve building. As for the North Sea benchmark price, that market is - and has been for maybe 12 years - owned lock stock and barrel by BP and Goldman Sachs. As Izabella has pointed out there is now very little spot oil which is unencumbered by financial claims such as prepay. Restrictions on production simply make manipulation/support of the price that much easier. The current 'tightness' is purely artificial,and the backwardation misleading. The WTI/Brent spread has IMHO been prima facie evidence of the financialisation of oil. The Brent market in the last 8 years has been the subject of the greatest market manipulation the world has ever seen. It makes Hamanaka's copper peccadilloes look like a Vicarage Tea Party. The resulting financial flows are so great they are almost incomprehensible, and the sheer audacity of the US/Saudi grand bargain (not their first) is staggering. Fair points, Chris. I confess I don't know all that much about this, although I know the oil market is the most rigged in the world and I'm quite prepared to believe that the Saudis deliberately manipulate prices - and that the US is party to this. Okay, that's flat-out false. Plenty of people thought that the British austerity would be disastrous, and lo and behold it was. If you don't believe me simply do a search on "austerity uk gdp" in 2010. Here's one example. I am, of course, talking about politicians, mainstream economists and the media. a simple stock and flows analysis would have given clear indication that front loaded austerity was a bad idea. As far as a Conservative-dominated government is concerned, neither is mainstream. What goes on in Conservative party circles and feeds through into government policy has very little to do with sensible analysis and an awful lot to do with politics. And as I pointed out in the post, international institutions and investors were firmly wedded to the idea of austerity. They've changed their tune now, of course. "What goes on in Conservative party circles and feeds through into government policy has very little to do with sensible analysis and an awful lot to do with politics." Much as I would like to, I cannot agree that their policies are politically motivated. They were/are, I believe, relying on supply side measures, monetary policy and the new 'voodoo economics' - the Barro/Ricardo equivalence to offset the fall in aggregate demand brought about by 'austerity'. Of course, these policies are more acceptable to 'right wing' governments? A very interesting and informative discussion. Energy is the life-blood of modern society, and, therefore drives much of the economic activity. A couple of posts allude to or explicitly mention the movement toward "renewables". No one, however, really addresses the huge economic impact of the funding of the energy "revolution". The UK, Germany, Spain, Ireland and others all are having serious second thoughts about the impact of heavily subsidized non-reliable energy sources. Surely the very expensive alternatives have not only increased the cost of energy, but also has threatened the manufacturing output of many nations. Although some are trying to account for the impact of this movement, I haven't seen a global assessment. Using Denmark as an example is somewhat dishonest as their entire system likely would fail if not for the backup of reliable hydro from Norway. It is becoming more obvious that the CO2 global warming hypothesis is in serious trouble as the new science (and data) question the original projections. Surely this plays a major role in the above calculations, affecting virtually very aspect of economies of nations. The replacement of reliable energy sources with unreliable technologies threatens any recovery. The vast bulk of Denmark's success in energy policy comes from their roll out of community level co-generation; hot water storage and heat grids. ie demand reduction, not the over-egged production of renewables, useful though that is. Perhaps you could explain in what sense energy savings are unreliable? Re back-up, Denmark pick up power from many sources of which Norway is but one - and they are not THAT reliable, having suffered both severe drought and floods in recent years. I have no interest in the global warming debate regarding it as an irrelevance. What will give the UK energy resilience is energy independence and freedom from reliance on foreign suppliers. You clearly are an advocate of the 'least £ cost' policies which gave us the Dash for Gas and increasing reliance on the benevolence of Norway, Qatar and Russia. I suggest you think again about what you wish for. Interesting angle. At least it's original although there's a lot of strange revisionism in that post. All the comparisons I remember at the time were with the great depression, not with 1979 or 1990. Also, the way the Eurozone crisis is brushed off "because the Irish bailout was expected" is strange. I can understand if we're talking about a crash in asset prices, but we're talking about slowdown in growth. And what about what was happening to demand from the rest of the UK's Eurozone trading partners? Shouldn't it matter? Personally, I don't buy the oil shock theory just because the opening graph look similar to him or the line is squiggly rather than smooth. First, the graph doesn't look similar at all to me and I would like some more serious statistical comparison than this type of eyeballing. Second, most of the other graphs are just showing that energy prices went up (ok, I may buy that a energy price shock happened, but that still leaves me none the wiser whether that is the main reason for the slow recovery). As to the final graph, it does show that energy consumption went down, but it also shows it was doing so from 2005 and actually slowed down the decline post 2009. So did it fall in 2010 by more than the trend? Or don't we care? All in all, the post doesn't seem very convincing to me. 1)You weren't listening, then. Comparisons were made to both the 1990 and 1979 recessions. And that is what the graph shows. 2) The Irish banking collapse had already happened - the sovereign bailout was really only an extension of it. And the bulk of the Eurozone crisis, which did clobber demand from the UK's trading partners, happened later. The timing of the Q4 2010 slowdown in the UK economy can't really therefore be ascribed to the Eurozone crisis. Can I also remind you that the UK actually runs a trade DEFICIT with the Eurozone - and our trade balance has got worse. 3) I used "eyeballing" as a start point. But I did not end there. It's almost as if you ignore the rest of the post. You don't think double-digit inflation in domestic and industrial energy prices mattered? How weird. It was sufficient to cause a major recession in 1979. With such enormous price rises, the wonder is that the UK economy DIDN'T tip back into significant recession, really. 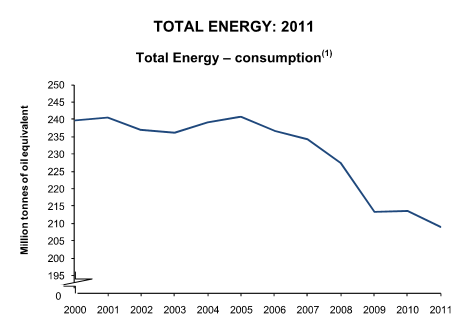 4) The final graph does show decline in energy use from 2005. But it also shows a sharp fall in 2008 and then a further decline in 2010. It is impossible to say what the "trend" is from that graph, and that is not why I included it. I'm interested in the fact that consumption levelled off in 2009 then fell again in 2010. Rising prices seem a pretty good explanation for that to me. 1) The most famous comparison was with the Great Depression was done by Barry Eichengreen and Kevin O’Rourke around April 2009, for which there was a follow-up with newer data in 2010. This was heavily cited. Krugman also wrote about such a comparison in March 2009. Perhaps you can highlight similar studies by economists of such renown that were comparing 1990 or 1979? At the very minimum, the Great Depression should be there along with the rest because it was the one famous economists were talking about. But it's not, which is at minimum suspicious. 2) The EZ crisis didn't hit all EZ countries equally. The demand crisis in some EZ countries led to the UK trading progressively more with Germany which is far more competitive. That means that the trade balance got worse because export markets were hit significantly and Germany far less. 3) I addressed that. The rest of the post is mostly highlighting that energy prices went up. They did, but the question is whether that was the main thing that led to the inflection of growth rates. And in that most of the post is silent on and relies on the lines looking similar. Also, a cost-push shock should raise the prices of other products along with the energy price rises. That's why cost-push shocks have an adverse effect on competitiveness, because the cost increase leads to manufacturing price increases. Adverse supply shocks tend to lead to price increases, adverse demand shocks tend to lead to price decreases. 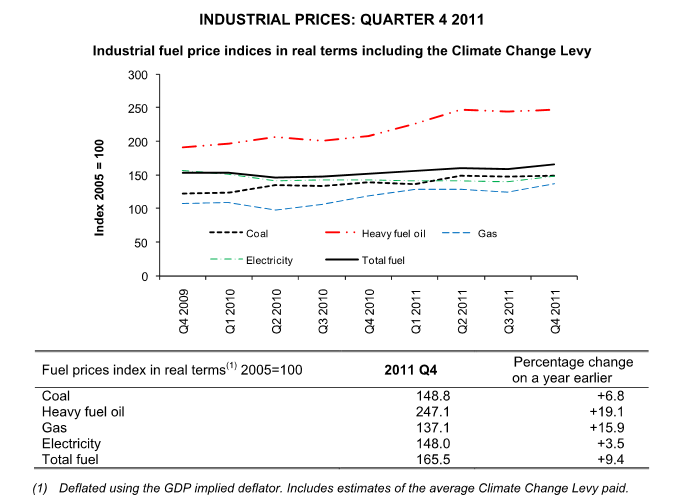 So to explain the lack of impact of rising energy prices on other products you need....a strong adverse demand shock. And that is actually coming from the other explanations you dismiss. The problem here is that dismissal, not that energy prices didn't play a part. 4) If you can't identify the trend, you can't identify the cycle. Simple, really. If anything, the only year that "looks" (and we're back to eyeballing) like an outlier there is 2009. 1) Eichengreen, O'Rourke and Krugman were all writing about the US not the UK. 2) I'm well aware that the Eurozone crisis did not impact all Eurozone countries equally. And I have not dismissed the idea that Ireland's bailout impact the UK's economy. I am however pointing out that the damage to the Irish economy was done earlier and the bulk of the Eurozone crisis was later - facts that you choose to ignore. unable to raise prices due to low consumer demand. Your comment amounts to denying the veracity of DECC's figures. 4)I am not trying to "identify the cycle". I am pointing out the fall in consumption in 2010. "(ok, I may buy that a energy price shock happened, but that still leaves me none the wiser whether that is the main reason for the slow recovery)." How significantly should we adjust for increased useage of energy efficient vehicles, products and better home insulation in the reduction in consumer energy levels during the period from 2005? Would such factors have any importance when looking at short to medium term trends. It did have some effect after the 1973 oil shock. Good point. I don't know, but obviously it would be a significant factor. I suspect more important from 2005-2008, though - that's when there were sizeable subsidies for home insulation and solar heating. Since 2010 I think the main issue has been price, including the imposition of green levies on household and industrial energy bills.